The Resident Tourist: Cinema Under the Stars . . .
Every year when summer rolls around New Yorkers spend their work weeks planning the great escape to varied beach destinations (The Hamptons, The Cape, The Shore) for the weekend. 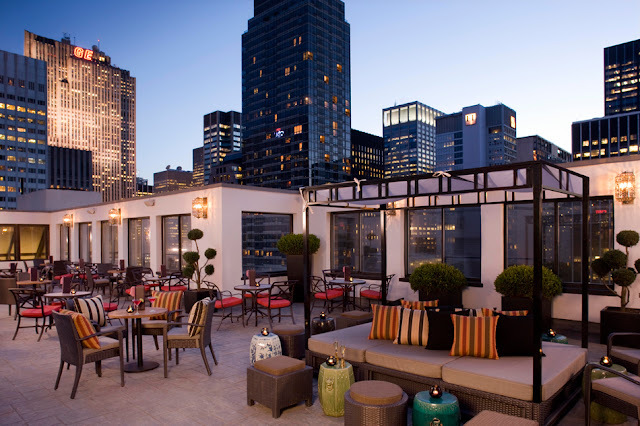 But while we're stuck in the city Monday through Thursday there are three things we all try to take advantage of during the summer months: rooftop bars, outdoor entertainment, and specialty cocktails. The Salon de Ning Rooftop Bar & Terrace at the Peninsula Hotel offers all three with their Cinema Under the Stars program. I don't usually like report on events that I haven't attended, but if I don't tell you now it'll be too late. Disclaimer: I was supposed to go last night for the screening of Hannah and Her Sisters, but after a trip to the ophthalmologist my eyes were so dilated that I couldn't see a thing, so I canceled the evening and went to Tao (where the lights are dim) for lychee martinis instead (specialty cocktails, check!). I'll be out of town next week, but if you're free and in the city this coming Monday, July 1st, you might want to check it out. It's the last night of the program, they'll be showing Woody Allen's Manhattan Murder Mystery with plenty of gourmet bites and sips for proper movie enjoyment. Reserving is simple and free - once there you need to spend $45 on drinks or food, which frankly won't be that difficult at the Peninsula Hotel. Let me know if you go! Would love to hear how is is.